AVAILABLE FOR DOWNLOAD ONLY. แจก user ทดลอง เล่น ฟรี ถอนได้Download the document in pdf format. The Childcare Resource and Research Unit's (CRRU) new report Early childhood education and care in Canada 2014 is its 10th compilation of Canada-wide data on child care and related early childhood programs. It considers child care space provision, budget allocations, and service delivery information in the 2012-2014 period, comparing these to previous years. It also provides detailed provincial/territorial descriptive information on kindergarten and child care programs (such as educator training, ratios, group/class size, governance and financing) as well as duration and payment for maternity/parental leave. The report is based on current data provided by provincial/territorial ECEC officials, Statistics Canada and other current data and research as well as CRRU’s ECEC in Canada series. 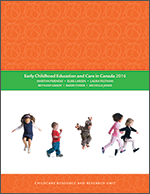 CRRU's ECEC in Canada reports have been published about every two years since 1992. They allow both cross-Canada and longitudinal tracking of ECEC programs and policy, as a consistent approach has been used to ensure data comparability. There were 1,201,377 regulated child care spaces for 0-12 year olds in Canada in 2014, an increase of 213,166 spaces since 2012. Of these spaces, 543,161 were centre-based for 0-5 year olds (full and part day), an increase of 39,932 since 2012. Thus, there were enough regulated spaces to "cover" 24.1% of 0-5 year olds in centres in 2014, compared to 22.5% in 2012. Canada-wide, there were 4,815,600 children 0-12 years of whom 2,256,600 were 0-5 years old. The employment rate of mothers with children aged 0-2 was 70%, 77% for those with 3 - 5 year olds and 82% for mothers with 6 - 15 year olds. Total budget allocations for child care in Canada (provinces/territories total) were $4,273,366,946. This represents an increase of $602,696,961 from 2012 (unadjusted dollars). 2014 median infant full-time monthly parent fees in Canada's largest cities ranged from $152 in Quebec cities to $1,676 in Toronto (toddler fees were $152 in all Quebec cities to $1,324 in Toronto and fees for preschoolers ranged from $152 in Quebec to $998 in Toronto). Eight provinces/territories now provide full day kindergarten programs for all five year olds; Ontario offers full-day kindergarten for all four year olds as well. 30% of centre-based child care spaces Canada-wide were for-profit, a slight increase (less than 1%) from 2012. A preliminary version of this report titled Preliminary data: Early childhood education and care in Canada 2014 was published in October 2015. This full report includes the information in the preliminary report, so supersedes it. There are a few small differences between the data in several of the tables in this report and the Preliminary data report due to recalculations or new information. Note: This is the revised copy of Early childhood education and care in Canada 2014 as of March 10th 2016.